Tickle My Senses: Rocky Mountain Oysters Pepper Fry. Rocky Mountain Oysters Pepper Fry. Anything that walks, swims, crawls, or flies can be eaten. It just takes an open mind and a willing stomach- Linda Stradley on What's Cooking America. We have tasted this delicacy thanks to the friendly butcher at our Asian grocery store 'Makkahs' who stocks a variety of fresh, hallal meat. Hubby first noticed these round shiny looking balls and was curiously excited. Eager to know more he queried the butcher. The butcher a young muslim lad was surely embarassed (probably my presence) said in a soft voice 'they are fries'. Whats that? i asked him, 'calfs testicles' he replied. 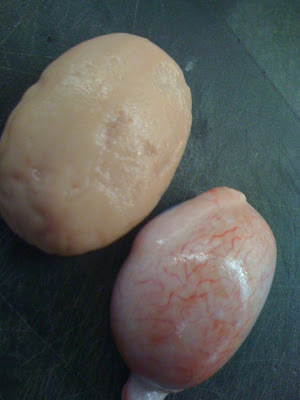 I was not sure whether i was game to eating testicles let alone cooking it and tried to dissuade hubby. But hubby was very excited, and had already envisioned on what could be made of it. So we took them home. Hubby prep'ed it and i had my pepper fry masala thrown in. Even though the end product was very tasty, hubby happily ended up eating most of it. Rocky Mountains oysters - also known as prairie oysters, Montana tendergroins, cowboy caviar, swinging beef, calf fires or bulls testicles- are true Western delicacies.They are that part of the bull that is removed in his youth so that he may thereby be more tractable, grow meatier, and behave less masculine. Eating animal genitalia dates back to ancient Roman times, when it was believed that eating a healthy animal’s organ might correct some ailment in the corresponding human organ of the male person eating it. Because of this belief, the practice continues to the present day, especially in Asia, where animal genitalia are considered an aphrodisiac. 1. With a very sharp knife, split the tough skin-like muscle that surrounds each testicle. Remove the skin. Then dice the testicle into approximately 1/4- to 1/2-inch-thick pieces. 2. Heat a frying pan, pour in 3tsps oil. 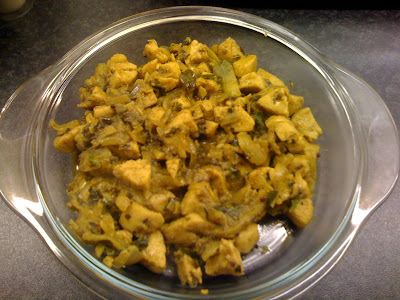 When hot add mustard seeds, once crackling add cumin seeds, curry leaves, and minced green chillies. Fry for a few secs then add sliced onions and ginger-garlic. Fry till onions brown. 3. Add the diced testicles, add salt, tumeric and pepper and fry till cooked. Add coriander, cumin spice powders and fry till all gravy dries up. Sprinkle garam masala and chopped coriander leaves. 4. Squeeze lime before serving and eat hot along with peas pulao or ghee rice.